We are a leading Manufacturer & Supplier of Hose Nozzle such as Hose Nozzles, Fire Hose Nozzles and Garden Hose Nozzles from India. Avail from us a wide range of Hose Nozzles, for which we are known manufacturer, exporter, wholesaler, trader and retailer. Available in different sizes and dimensions, these nozzles are manufactured using a blend of synthetic polymers. Commonly used in power generation stations and substations, these nozzles are widely demanded in national and international markets. Counted among the illustrious manufacturers, exporters, wholesalers, traders and retailers, we are engaged in offering Fire Hose Nozzles. Widely used in power generation plants and transformer stations, these nozzles are widely demanded across the global markets. Having excellent insulation properties, these nozzles are available in different dimensions as per the demands of clients. 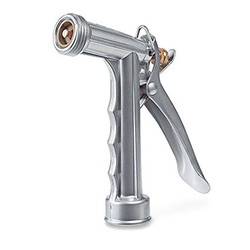 Gained prominence as a manufacturer, exporter, wholesaler, trader and retailer, we are engaged in offering our clients with Garden Hose Nozzles. Utilized in various industrial applications, these nozzles have high dielectric strength and provide optimum protection against electric shocks. Manufactured using premium quality material that is characterized by dense texture, these nozzles are provided in different dimensions and designs.